Though perhaps more common in terminology today – in the sense that many people have heard of it – HR analytics still falls under that umbrella of ‘too complex’ or ‘too confusing’ for many people. Instead of really taking a look at what it is and what it can do, the concept therefore is simply passed over. And sure, that sounds precisely confusing and complex. At its heart, however, HR analytics is powerful when applied to the problems of a business. In short, it could be the best business tool at your disposal. Some may refer to it as people analytics. I prefer the term workforce analytics. Whatever it is called, analytics driven by the HR function can be immensely powerful to drive revenue growth, productivity improvements and individual engagement to the vision, mission and objectives of your business. Many of those who shy away from or profess to being baffled by the idea of analytics are already using the tool in their everyday lives; they just don’t know it. Consider Netflix or platforms like Apple TV, which will make recommendations to users based on what they’ve watched previously and other shows that may be similar. Or how about the smartphone app that picks up on your usual routine of heading to the gym after work that recommends a different route home because of construction taking place? How about the recommendation you are sent for places to stay in London or discounted flights because an app has tied into your schedule and recognised a planned upcoming trip to the city? These are all achieved through data and analytics. While in life it may be about the journey, rather than the destination, when it comes to analytics, it is all about the destination. The important thing to recognise is that the focus of the user in these scenarios is not on the analytics itself, but on the end result – the film being purchased, the route taken, the hotel you stay in. From a consumer perspective it is about making the life of the consumer – you or I – easier. No one is talking about the behind the scenes effort; the data and analytics, and incredibly powerful technology that makes this all happen. No one is talking about the mathematics or the algorithms that drive the recommendations that are providing the information. No. All of the statistics, the experts, the processes and technology are all left in the background. The consumer experiences only the outcome and the presentation (the app) of the outcome. And this should be true of HR analytics too. Focus on the employee. The worker. The business. Focus on the outcome to make employees and workers more engaged, more productive and better informed. Then help the business leaders and managers deliver value. This is the true value of analytics. While in life it may be about the journey, rather than the destination, when it comes to analytics, it is all about the destination. Because without a destination, the analytics becomes confusing, complex, unnecessary and unimportant. And this is when people don’t understand it. Just as service providers and app developers have taken hold of the power of analytics to drive traffic to their websites and apps, so too can business owners use analytics to support their efforts. Let’s say you want to enter new markets, are focused on growing revenue or increased customer share and a key need will be retaining staff with specific skillsets, or recruiting new people who have the talents you’ll need moving forward. It is for these reasons that HR analytics has a reason to exist and will drive you to the destination you desire. Or perhaps your focus is on reducing costs to make the business more competitive. Here, people analytics might focus more on productivity and cost management. Or perhaps your focus is better win rates for sales, faster time to delivery, improved supply chain or improved innovation. Whatever else you may identify as a problem, a goal, that is the starting point, analytics provides the insights to help inform the future decision. You determine the destination and analytics will help get you there, but you don’t need to be along for the ride. There are two factors that put up blockages when it comes to HR analytics. The first is the fear of the unknown, of what we don’t understand. Yes, analytics involves a bit of research, some technology, and, yes, mathematics and statistics. But there are experts in the field who are skilled in and specialise in handling this. The business executive or HR manager doesn’t need to understand the complex variables, they need only understand that they have a problem and want to find a solution that looks beyond what they have tried, and possibly failed with, in the past. Don’t fear the mathematics or the technology; don’t worry that the results will be too complex. The other blockage can result from the analytics experts themselves. These are the professionals who feel the need to share the details of how they have derived their answers; the details of the process. This is not in any way necessary or required for all audiences in the business. Often, all that is required is the insight and recommendation that helps answer the original business question. And this is true of HR analytics too. For example, the business executive, HR business partner, or manager wants to know whether to hire or not hire a person. They want to know whether to place a retention package to save a person who resigns. Or better still, reduce the risk of the person resigning in the first place. They don’t need to know the statistics behind the recommendation – they just want the recommendation. It is important, for business owners and HR professionals, as well as people analytics experts, to understand the creative potential of data. Beyond the numbers, analytics offers an opportunity to tell a story visually, to share infographics and pictographs that represent a concise narrative of both a problem and a solution. The old saying goes that a picture is worth a thousand words. Just as analytics is about solving problems through the use of a creative process and tool, so too can the presentation of the results offer a creative way to help others understand the results and the vision moving forward in a way that is concise and right there in front of you. 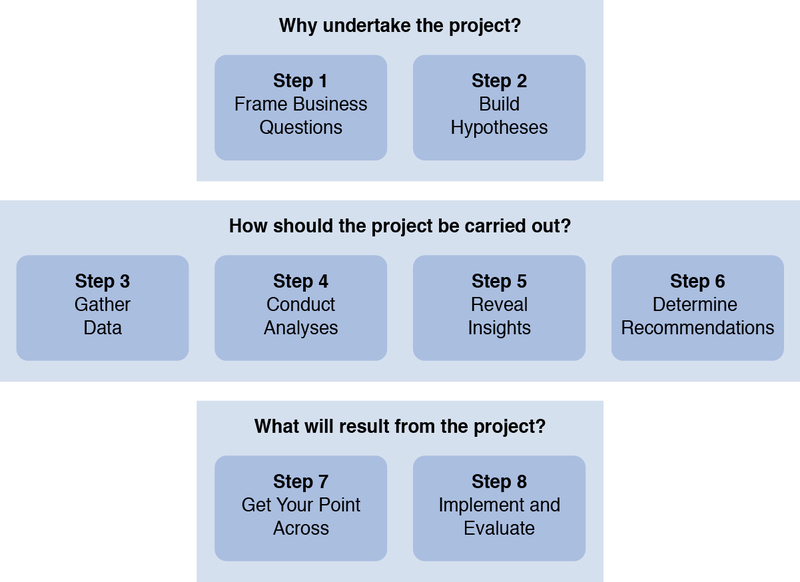 In the book I recently co-authored with Nigel Guenole and Sheri Feinzig (The Power of People), we outline the Eight Step Model for Purposeful Analytics (see figure below). This model helps analytics and business/HR professionals alike bring clarity from analytics. I recommend that the non-analytical person should focus on Steps 1, 2, 7 & 8. Leave steps 3-6 to the analysts. These are the deep, hard, complex and highly skilled steps that they will focus on. But if HR professionals – and their stakeholders – don’t focus on the first two and last two steps, HR analytics will always remain confusing and complex. Focus on understanding the business first and foremost. Don’t fear the mathematics or the technology; don’t worry that the results will be too complex. HR Analytics, if done correctly, is a discipline that simplifies and informs decision making to improve your business performance.